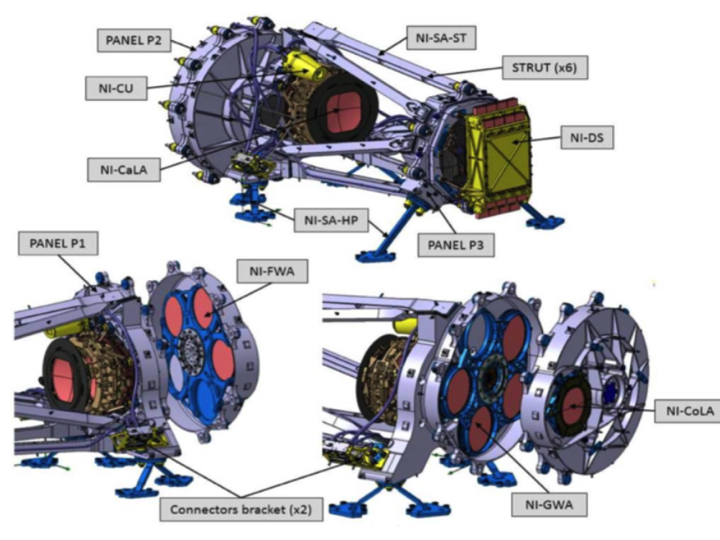 The Near Infrared Spectrometer and Photometer (NISP) instrument is under the responsibility of the Euclid Consortium. NISP aims at providing near infrared (between 900 and 2000 nm) photometry of all galaxies observed also with VIS and near infrared low resolution spectra and redshifts of millions galaxies. The near infrared photometry will be combined with VIS data to derive photometric redshifts and rough estimates of distances of galaxies seen by VIS. The near infrared spectra will be used to derive accurate redshifts and distances of galaxies and their 3-dimensional position in the Universe. The NISP spectroscopic data will primarily be used to describe the distribution and clustering of galaxies and how they changed over the last 10 billion years under the effects of the dark matter and dark energy content of the Universe and of gravity. The NISP focal plane is composed of a matrix of 4×4 2040×2040 18 micron pixel Teledyne TIS detectors covering a field of view of 0.53 deg2 shared with VIS, with 0.3 arc-second pixels. The photometric channel will be equipped with 3 broad band filters (Y, J and H) covering the wavelength ranges [900-1192]nm, [1192-1544]nm and [1544-2000]nm, respectively, with a mean image quality delivering 50% encircled energy within 0.3 arc-second and 80% encircled energy within 0.7 arc-second. The spectroscopic channel will be equipped with 4 different low resolution near infrared grisms (R=380 for a 0.5 arc-second diameter source), 3 “red” (1250 nm – 1850 nm) and 1 “blue” (920 nm – 1250 nm), but no slit (“slitless spectroscopy”). The three red grims will cover the same wavelength range but will provide spectra with three different orientations (0o, 90o and 180o) in order to decontaminate each slitless spectrum from possible overlapping spectra of other sources in the field. An overview of NISP subsystems is shown on the figure below. 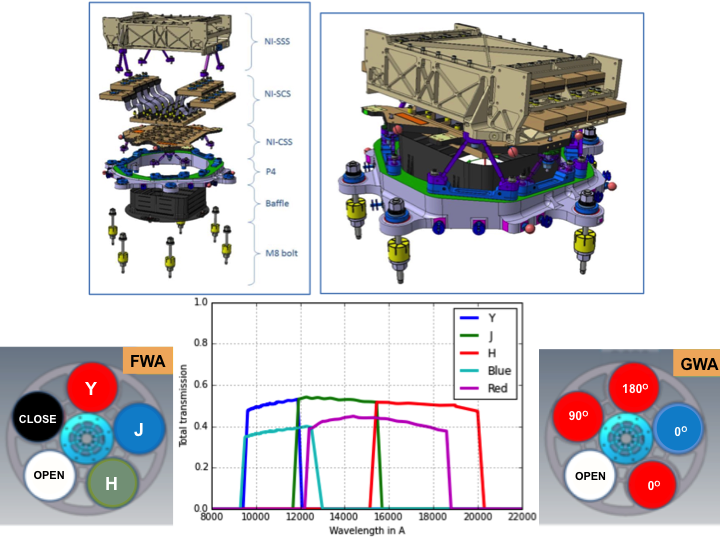 The overall throughput of the NISP instrument will enable scientists to measure photometric and spectroscopic redshifts of galaxies with sufficient accuracy. The NISP photometer will be able to get a signal-to-noise ratio of at least 5 down to magnitude 24.0 in about 100 seconds per filter. The NISP spectrograph will provide redshift of about 30 million emission line galaxies over the redshift range 0.7 to 2.0 in about 4000 seconds. NISP succesfully passed the Critical Design Review in November 2016 (see the EC News pages) and is now en route for building the flight model.